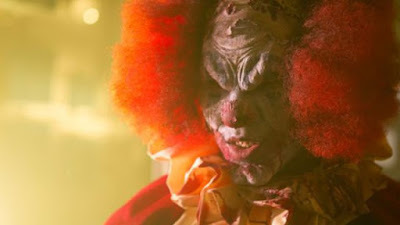 Blimpo the Clown and his fellow circus performers are all killed while on tour in Romania. Back in the States the body is sent to a newspaper building for the night before heading off to the funeral home. As the security crew breaks in a new guy, Blimpo rises from the dead and begins a bloody zombie rampage. Blood and gore mix with off the wall humor to make a very funny and surprisingly tense horror comedy. Knowing all the rules for a film like this, THE NIGHT WATCHMEN quickly sets about breaking them with wild abandon. Rules are meant to be broken as are funny bones which get cracked by the very knowing humor. With great practical effects adding a realness to it all the film manages to actually keep you on the edge of your seat laughing as you ponder exactly who is going to live and who is going to die (horribly). I enjoyed the hell out of this film to the extent I sent out emails to all my horror friends telling them to keep an eye out for this wonderful little gem. Highly recommended to gore hounds when it plays tonight at Fantasia-assuming you can score tickets.